I've so been looking forward to this! This week we have only one block to make. For the other weeks, there will be more than one block. Hhmmm...have I got ya wondering?? When I first announced the Market Day Sew~along, I told you the blocks would be fairly simple to construct, and they'd be 3 inches finished, and they are. For those of you looking for a bit of a challenge, I'm also going to give you cutting instructions to make your blocks at half the size! That means they will be 1 1/2 inches finished! OMG, OMG....they are sooooo cute! Challenging myself to do things "out of my comfort zone", and trying new techniques is something that I feel strongly about, and has been on my mind a lot lately. That's how we grow as quilters! Is there nothing better than trying something new, learning from it, and feeling that satisfying moment of success? So.....if you've ever wanted to try making a sweet, tiny little block, this is a good time. Really, they're adorable! What have you got to loose but a few scraps? 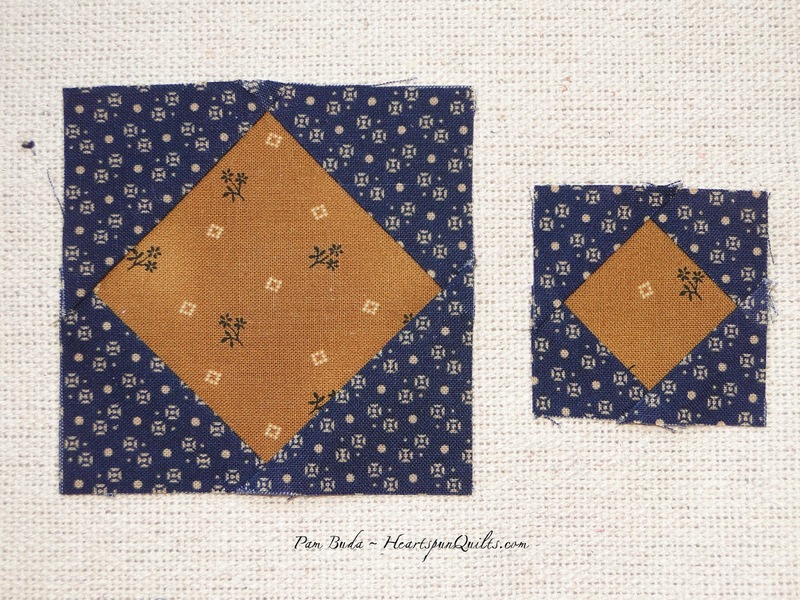 Consider making both quilts with the smaller blocks/quilt in a different color-way than the full size version. Perhaps a green, red, gold and lights version for Christmas? While these blocks are little, they are very do-able. Give them a try...I will happily take the credit for your new addiction to tiny blocks!! The cutting instructions and directions for the half-size, smaller size blocks will be listed in red. *Draw a diagonal line on the wrong side of the (4) 2" (1 1/4") blue print squares. Position one blue square in a corner of the 3 1/2" (2") gold print square. Sew just a scant two threads inside (the seam allowance of) the diagonal line; press and trim the connector corner. Repeat these steps for the remaining corners of the gold print square. Make (1) Square-in-a-square block measuring 3 1/2" (2") unfinished. We're on our way! More next Friday, so be there or be square. Teehee! Have fun!! Prairie Stitches Bundles Are Ready To Go! We had a lovely Easter weekend here with warm, sunny weather that beckoned us to stay outside all day. And that we did! After the dreadful winter we had it felt so wonderful to be outdoors, sitting on lawn chairs, visiting with family and friends. So good for the soul! Like everyone preparing for Quilt Market, I'm immersed in getting the stuff for my booth ready and working on new things that will be introduced there. For the past nine months, I've been working on a very big project that will make its debut later this summer. Want a hint? The folks at Marcus Brothers Fabrics asked me to do a Block of the Month program! That means design the quilt and the fabric line to go with it!! WOW!! Actually, my BOM isn't really a BOM at all. The Prairie/Pioneer woman in me took another path and came up with something different and quite exciting. The quilt design is complete, and the fabric is, too. It won't be long now until I can share pictures with you, so stay tuned to my blog for all that's new. My newest fabric collection for Marcus Fabrics, called Prairie Stitches, is being delivered to your local quilt shop now. Please ask for it when you're at the shop. In case your local quilt shop doesn't offer bundles, you can purchase Fat Quarter and Fat Eighth Prairie Stitches bundles from my website. Click here for all the details. 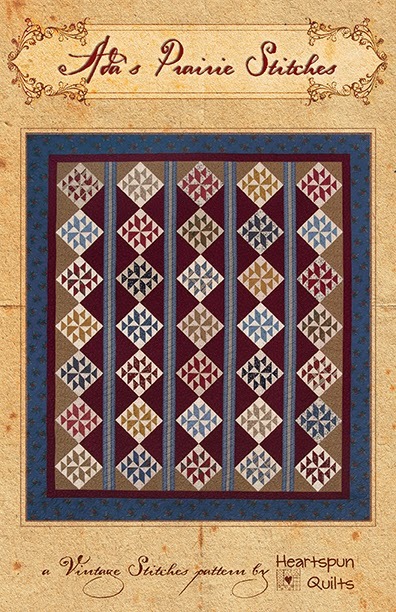 My Ada's Prairie Stitches pattern features all of the fabrics in the Prairie Stitches line. 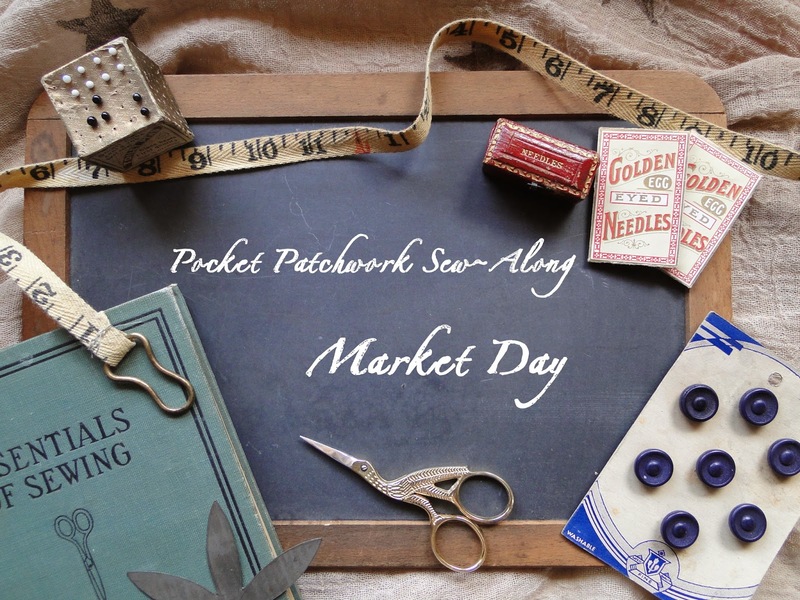 Don't forget.....my new Market Day Sew~Along starts this coming Friday, April 25th!! Please share the news with your friends. At last....it's time to begin. We've only been talking about this sew~along for weeks. I know you're gonna love this quilt!! See you Friday!! Presently, I'm staying home working on a lot of new things and preparing for Quilt Market next month. Once Quilt Market is over, I'll be hitting the road for some really fun workshops. It's such a pleasure for me to spend time in the classroom with really great people.....quilters like you! I love to travel, and to teach, so it's a "win-win" for me!! Lynne Hagmeier will be there too! I have been teaching for many years and always have a great time spending the day with quilters. I thoroughly enjoy passing along as many hints, tips and skills to the folks in my workshops, and always learn some pretty cool things from them as well! It's a great experience sharing what you love with kindred spirits. You're invited to join the fun, and I hope to get the chance to meet you! Are you counting the days until next Friday when my Market Day Sew~Along will begin? I can hardly wait for it all to start. I just know you're gonna love this quilt! Favorite New Book & Market Day Sew~Along Start Date! 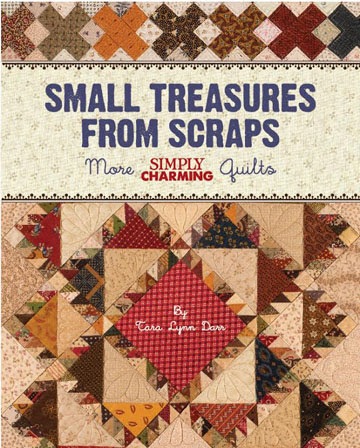 At last.....my dear friend Tara Lynn Darr's book, Small Treasures from Scraps, the long awaited sequel to her first book, Simply Charming is finally out!! Like her first book, the Small Treasures from Scraps book features doll sized projects that are clever and delightful quilts to make from scraps and 5 inch squares you have on hand......scraps you have just laying around waiting to be made into something wonderful. There are fourteen wonderful projects waiting for you. Bet ya cant' make just one!!! Click here to order the book or look for it at your local quilt shop. I'll post the first block instructions that day and we'll finally be sewing together. I really do love this quilt, and I'm pretty sure you're gonna love it too! The blocks are pretty basic, and to shake things up a bit, I will be offering you a challenge. Will you be up for it?? Have I got you thinking?? To be sure you won't miss a week of instructions, the very best way to participate in the sew~along is to get my blog posts via email. To do this, simply enter your email address in the "Follow by Email" icon found on the right hand side bar of my blog. You will receive a verification email from Feedburner. You must verify your subscription with them, which is simply to click on the link they provide. Once that's done you're all set. Getting my blog posts via email will also allow you to save all the sew-along instructions in a folder which is especially helpful if you can't sew-along with us right now. Click here to get the yardage and all other Market Day Sew~Along information so you're ready to join the fun. It won't be long now! 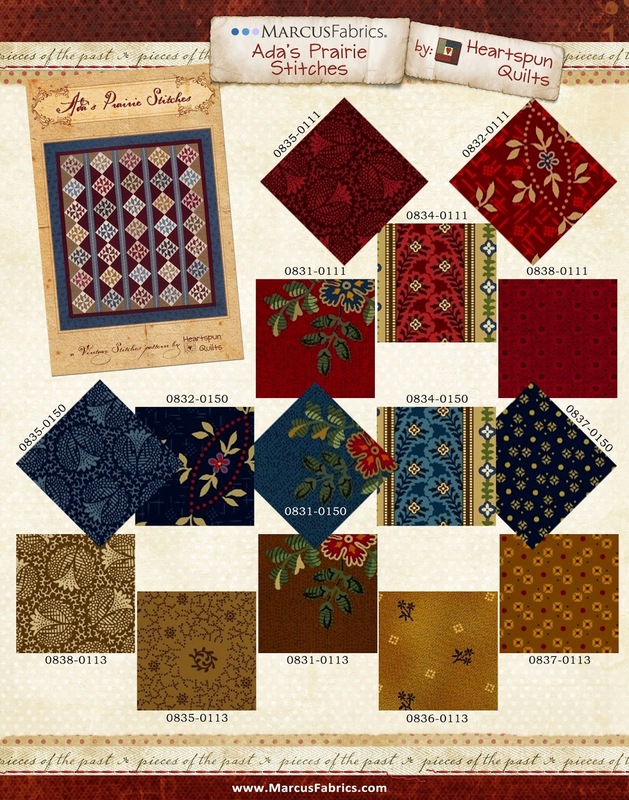 Prairie Stitches Fabric Collection In Stores Now! My newest fabric collection for Marcus Fabrics, Prairie Stitches, is arriving in your local quilt shop this week! My new pattern, Ada's Prairie Stitches, uses all of the fabrics in the Prairie Stitches collection. 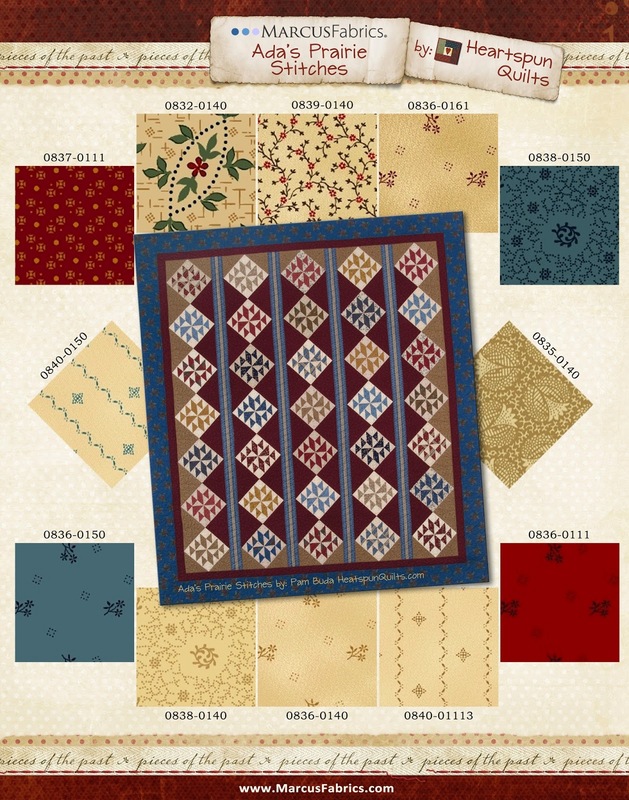 The reds, blues, browns, and golds in the collection blend beautifully with the creamy lights creating a cuddly quilt sure to keep you toasty!! Be sure to look for Prairie Stitches at your local quilt shop! The Market Day Sew~Along fabric kits are almost done and I'm getting ready to ship them. If you ordered a kit, you'll receive an email from me notifying you that it's on its way. I'll be announcing the start date of the sew~along in my next blog post, so stay tuned. Remember to invite your quilting friends to sew~along with us.....it's gonna be the best one yet! Please join Lynne Hagmeier of Kansas Troubles Quilters and me in Mackinaw City, MI this September 8-12, 2014. We're hosting another Great Girlfriend Get-Away Retreat. Click here for all the retreat info and to see the FOUR projects you'd be making. Good times, great memories!! Silk thread is wonderful to use when sewing things like needle-turn applique or English paper piecing (EPP) hexagons and pentagons together. This strong thread is very thin and because of that, the stitches "sink" into the fabric virtually disappearing. While loving the attributes of silk thread, it does have its down side. 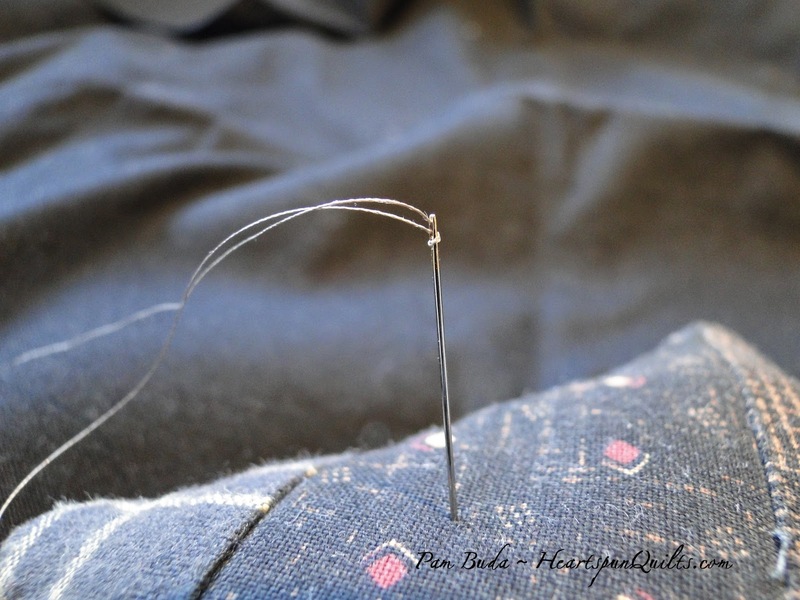 Because it's silk, and slippery, it often slips out of the eye of the needle causing you to re-thread and re-thread the needle. Frustrating, to say the least!! Like everything in quilting, it's always the hints and tips that can make such a big difference in the pleasure we get and the ultimate outcome of our work. 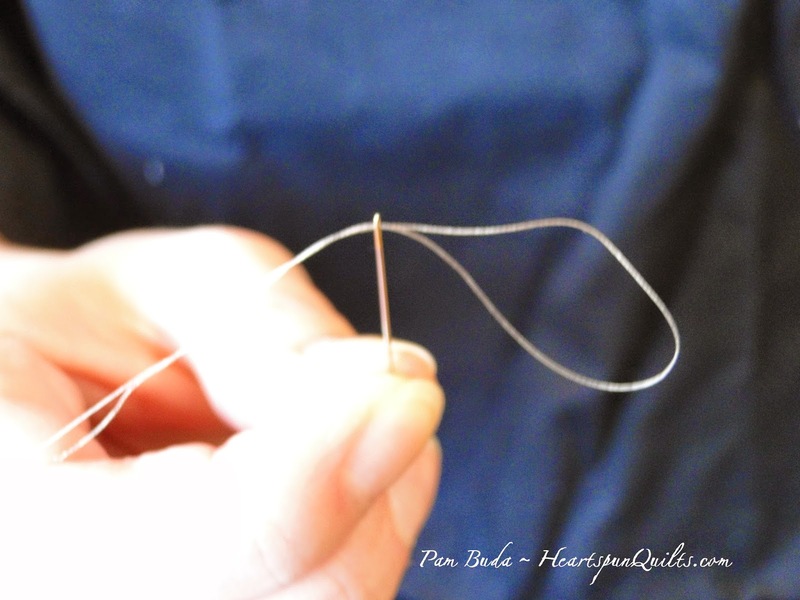 Here are my tips for ease and success when working with one of my favorite things.....silk thread! These are my preferred tools for working with silk thread. They are part of a very helpful technique I'm about to share with you. I love the taupe color silk thread paired with the John James Golden-eye applique needles (size 10). I use Thread Heaven conditioner and a Clover needle threader. Look for these items at your local quilt shop! If you can't find them there, they are available on my website. 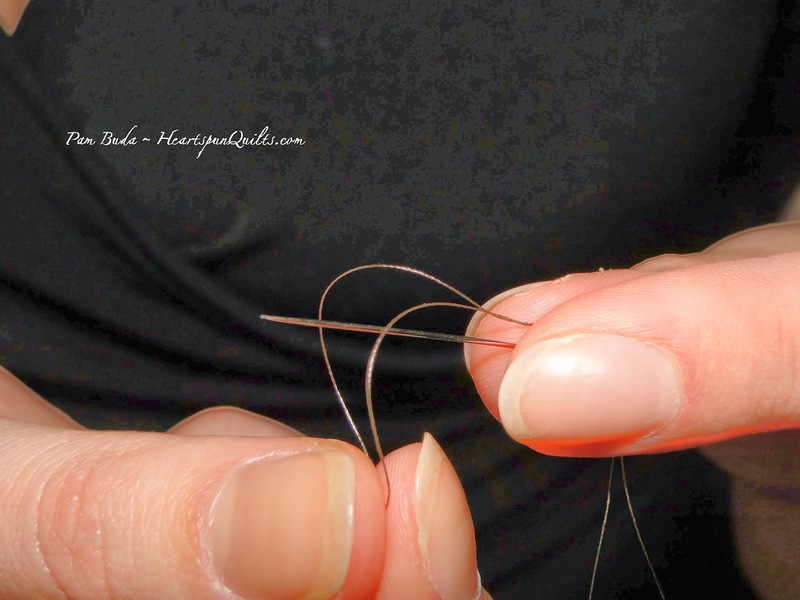 I use the taupe color silk thread for 99% of all of the sewing I do using silk. It blends very well with every color fabric. (You'll see pictures of how it looks in patchwork at the bottom of this blog post.) The only time I don't use the taupe thread is when I'm working with all/only black fabrics, and then I use black silk thread. *Cut a length of silk thread no longer than 18". Any longer and you'll just struggle with it. 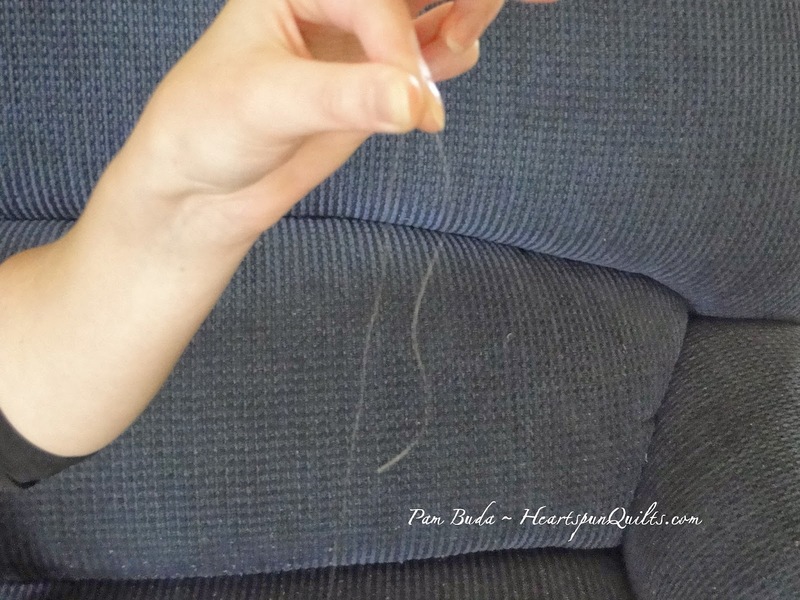 *Run the entire length of thread over the Thread Heaven conditioner. Thread Heaven gives the thread some body, removes static cling and helps to prevent it from knotting and twisting. 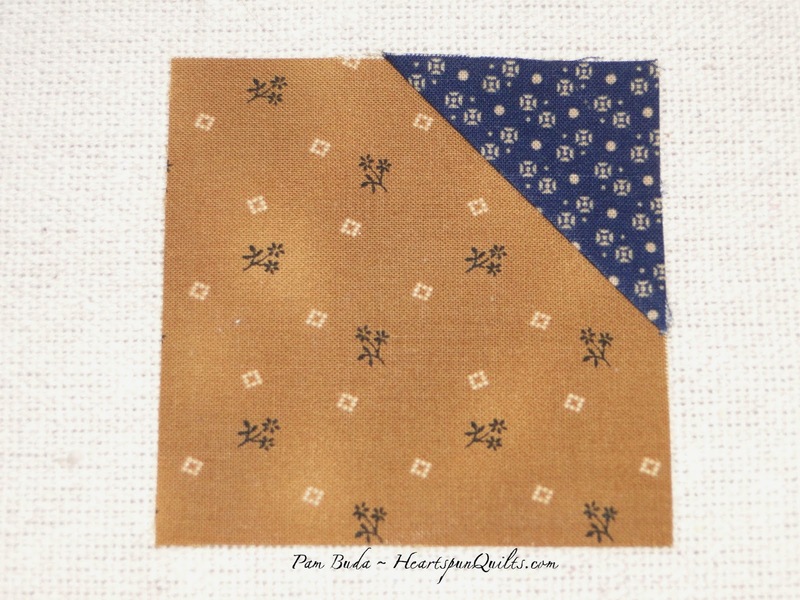 For needle-turn applique, and EPP, I prefer using the John James Golden-eye applique needle in size 10. It's a perfect partner with the silk thread. The "golden" part of the eye helps you to see the very small eye. 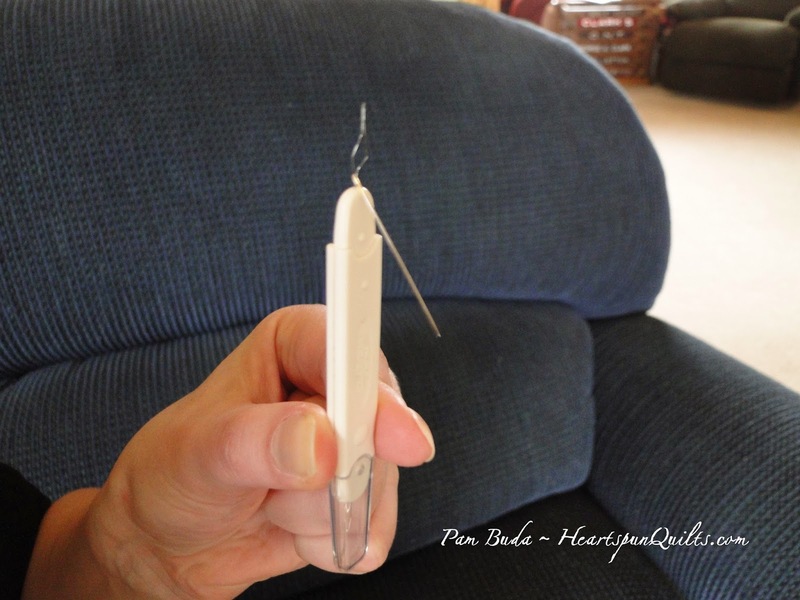 This narrow needle and the needle threader help immensely with this technique making everything easy to hold. With the 18" of silk thread, fold over a 3" tail. 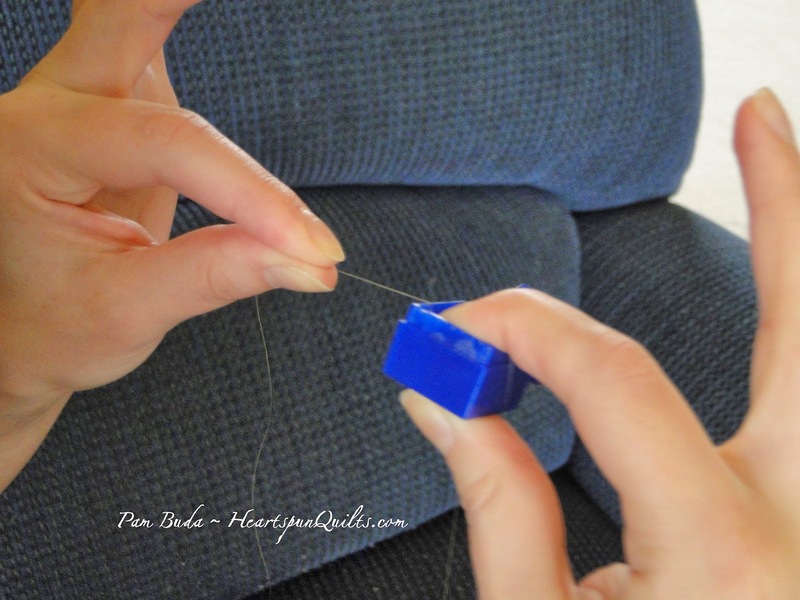 Push the loop of the thread through the wire threader. (The end of the tail should still be on the other side of the wire.) The needle is still resting below the silk thread. Carefully lift the needle off of the threader. In doing so, the thread will go through the eye of the needle. 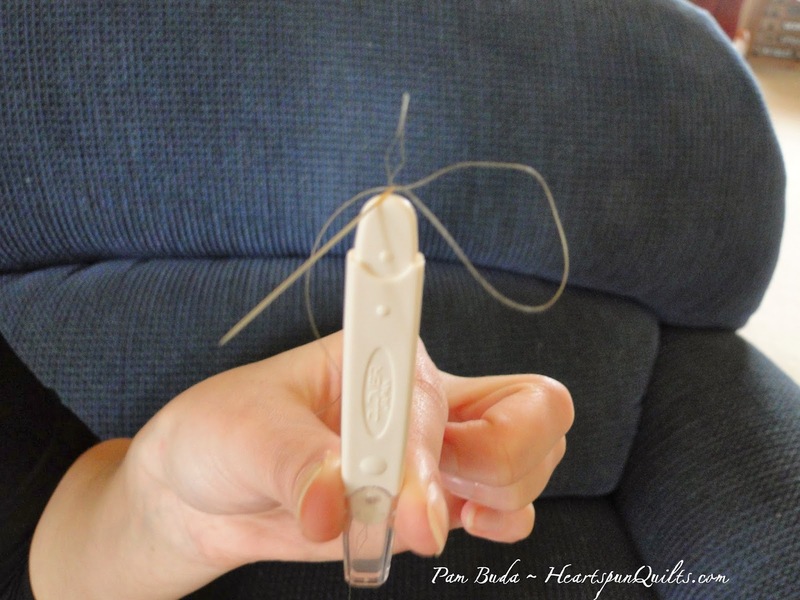 You no longer need the needle threader. The needle should be positioned half way between the looped end of the thread and the end of the 3" tail. Bring the sharp point of the needle inside the center of the loop. Hold onto the needle and pull the threads down toward the eye. *This technique results with a slip knot at the eye of the needle! Can you see how the thread is wrapped around the eye? The knot will stop the silk thread from constantly slipping out of the eye so you don't have to re-thread the needle over and over again! Use this technique only when using silk thread! The thin John James #10 needles and the thin silk thread are narrow and small enough that the knot does not interfere at all with your sewing. Any other needle and thread will be too thick, and the knot too large, that the needle won't penetrate the fabric. Hence, this technique only works with silk thread. 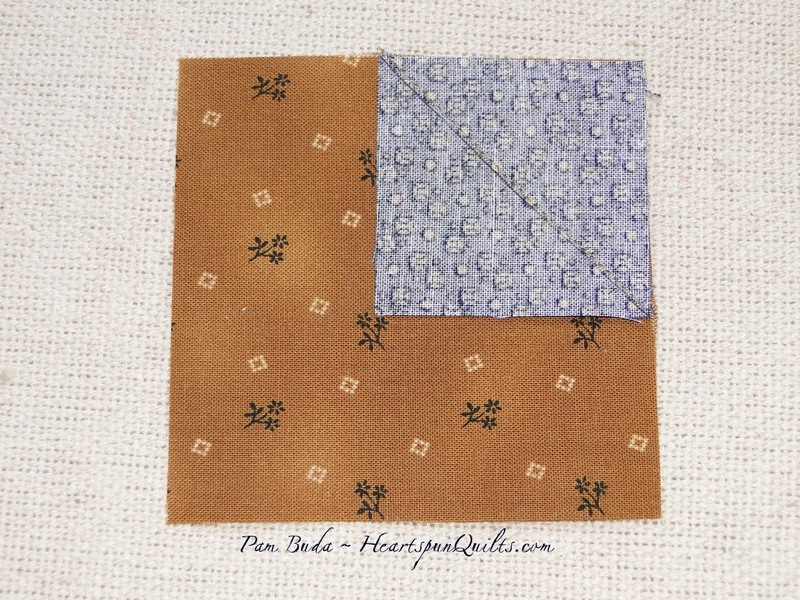 Here's a look at a bit of my patchwork stitched with the taupe color silk thread. The basket block above was needle-turned using it, and these hexagons were sewn together using it. Barely detectable, the silk thread sinks into the fabric, and the taupe color blends well with all color fabrics! Remember, the silk thread, Thread Heaven, needle threader and John James needles are available at your local quilt shop. Please ask for them on your next visit. If they don't have them, you can get them from me on my website. I truly hope you find the tips in this tutorial helpful. If you've never worked with silk thread, I encourage you to give it a try. It's really wonderful! You can always access this tutorial (and several others) by clicking on the "Tutorials" tab at the top of my blog page. It will be there whenever you might need it! I've also received a new shipment of these wonderful clip-on magnifying glasses, and as of this posting, and all other notions are back in stock.